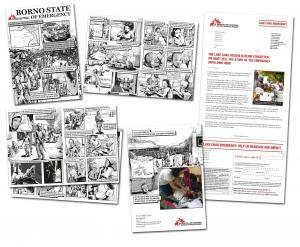 Over the past few years MSF had experienced a decline in response rates to their emergency appeals. The same format had been used a number of time, meaning the pack wasn’t having the same impact. Refresh the format to create disruption with supporters. The graphic novel style we developed allowed us to bring incidents to life we never would have been able to using photography, either because those images didn’t exist, of if they did, because they would be too shocking to use. The format had the desired effect, with a 50% income increase in comparison to the previous emergency appeal.